Housed within the SLS Hotels, with outlets in Miami, Las Vegas and Los Angeles, The Bazaar by José Andrés is kind of like Willy Wonka (Mr. Andrés, in this case) meets a tapas restaurant. The set-up, the colors, and of course, the food and wine, all play on your senses in a comical, whimsical way that immediately puts you in a mood where you’re ready to explore, experiment and enjoy. It’s a unique dining experience that was voted among the Top 10 Hotel Restaurants in the World. Renowned sommelier Rachel Macalisang is at the helm of the wine list of the Los Angeles location, a post she assumed in 2014. Prior to her arrival at The Bazaar, the LA native earned her stripes at top tier restaurants in Napa and San Francisco, continuing to build her expertise with each new role. Her personality (on full display on Twitter and Instagram at @winebadass) is a perfect fit for The Bazaar, and now Spain has become her new passion. Chef Andrés’ riff on a Philly Cheese Steak: Hollowed out mini baguettes that have a cheese foam piped inside, and then thinly-sliced barely-seared beef is placed on top. The dining room tips its hat to old-school Spain while still being a very modern restaurant. The signature Olives Ferran Adrià dish features olives two ways: Traditional, and “Modern” — aka olive juice that undergoes a molecular process to become a ball of liquid olive with a thin skin. You eat it, and it bursts in your mouth. 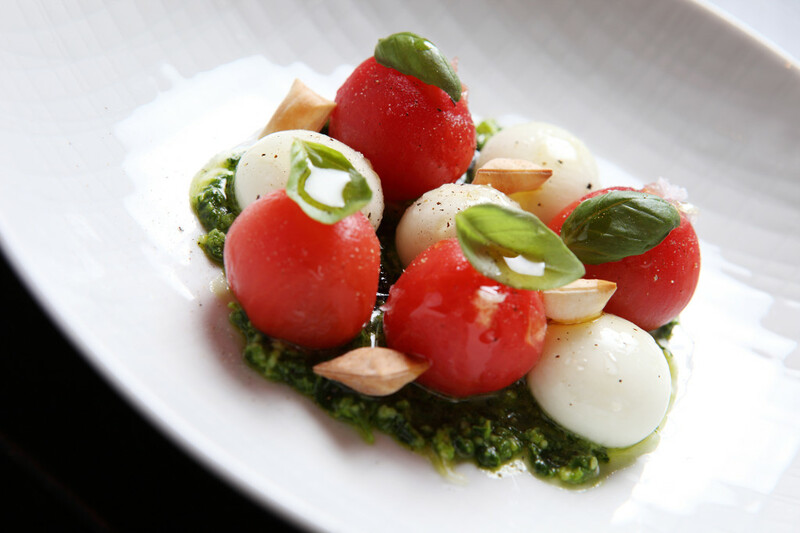 The Not Your Everday Caprese goes a similar route, as those mozzarella balls you’re seeing are actually liquid inside. Inside the SAAM room, guests are served a 21-course tasting menu with individual wine pairings to accompany each dish. Macalisang describes a typical visit as a “modular dining experience,” with guests starting in the bar before choosing to go to one of two dining rooms—Rojo, which features dark colors and more conventional décor or Blanca, a stark white, modern space. Basically, red or white, a metaphor that plays perfectly into Macalisang’s capable hands and Bazaar’s well-stocked Spain-heavy wine list. With regard to wine pairing, the concept at The Bazaar is very different from what Macalisang was accustomed to because of the volume of courses generally served. At The Bazaar, the small bites of food come out rapid fire and there are often many items on the table at once, so it is difficult to pair wine one dish at a time. In fact, Macalisang tells us it was a little overwhelming at first, having just four days of food training with over 90 dishes to taste and prep pairings for. As a solution to her delicious dilemma, she curates flights of wine to offer a choose-your-own-pairing variety. In SAAM, which only offers a 22-course tasting menu, a one-to-one pairing is easier. Macalisang says the Not Your Everyday Caprese, thanks to its liquid mozzarella balls, is “an amazing match” for Rueda wines. Switching gears to red wines, Macalisang proposes that, “You really can’t deny the history of Ribera del Duero with Vega Sicilia; it is one of the best wineries in Spain, if not the best.” And much like how Rueda is a perfect Sauv Blanc alternative, Ribera del Duero also has a reference point. Knowing that her staff are fascinated about wine, but perhaps not as knowledgeable as she, Macalisang helps them remember with acronyms and other mnemonic devices that are a good indicator of her personality. “Don’t be a [insert a particular Spanish expletive]; drink a Verdejo!” is one of the more memorable ones. Similarly in terms of personality, Macalisang recently threw her hat (and the rest of her attire) in the ring for the Penfold’s & GQ “Best Dressed Somm” Competition. She didn’t win, but tells us she had fun participating and wants a second crack at it. “I’m definitely all about play and participation. It’s what I teach my staff,” she says. Tracy Ellen Kamens is a wine educator, writer and consultant based in New York City. She holds the Certified Wine Educator credential from the Society of Wine Educators and the Wine & Spirits Education Trust’s Diploma of Wine & Spirits (with Merit) and earned a Doctorate of Education from the University of Pennsylvania. In 1994 an exciting new era for Rueda was dawning. It was in that year that a Frenchman, living at the time in Nava del Rey, released a wine that was to change the shape of things to come for the Verdejo grape. This wine was Belondrade y Lurton - a Verdejo, fermented and aged on its lees; an elegant wine, harmoniously integrated in the oak, unctuous, and expressing the complexity offered by the different terroirs in which it was grown. Didier Belondrade’s belief in the ageing potential of wines made with the Verdejo grape was growing with each new vintage; and in the year 2000 this conviction was mirrored in the building of the winery at La Seca, designed by the architect Vicent Dufos du Rau. Dominio de Pingus is a Spanish winery located in Quintanilla de Onésimo in Valladolid province with vineyards in the La Horra area of the Ribera del Duero region. Dominio de Pingus was established in 1995 by Danish oenologist Peter Sisseck, also manager of the Pesquera de Duero estate Hacienda Monasterio. On the estate's winemaking philosophies, Sisseck has stated, The vines in my plots are very old. They have never been fertilised nor treated with pesticides and all grow following the traditional en vaso system. They are perfect. The 4,700 square meter winery, Bodegas Nexus, was built recently. It has the capacity to process 300,000 kilos of grapes from the vineyards that belong to the winery, located in the heart of Ribera del Duero. Pago de los Capellanes is located near the village of Pedrosa de Duero, deep in the heart of the Ribera del Duero region of Spain. In the 14th century, a chaplainry existed in the village and the inhabitants donated small parcels of land to the chaplains in appreciation for their performance of religious duties. Over time, the chaplainry came to be a sizeable landholder. In 1855, the lands were given over to the city council and the estate being home to vineyards becomae the Pago de los Capellanes winery. Vega Sicilia's ultimate goal is to become the global prestigious benchmark of a single culture based on the constant search for excellence, harmony with nature and endless meticulousness and dedication. This is all down to the work of an outstanding human team and principles and values that transcend the individuals, both of past and future generations, and that set the path to be followed. Underbelly is helping fuel the dining scene by putting a Vietnamese, Korean and Asian twist on Texas standbys. Would a Danish fellow who learned the wine craft in Bordeaux be able to figure out how to make wine in rough-and-tumble Ribera del Duero? Esteemed wine critic Robert Parker thought so, definitively declaring Pingus’ rookie offering “one of the greatest and most exciting wines I have ever tasted." Doing the same old thing simply isn’t in the cards for the Belondrade family, who make wines in Rueda that will buckle your knees. For years, Camino Pardo's Nexus wines were a hit all over the world … except one very important person still hadn’t tasted them: her father.